↑ "Vegetable Research & Extension Center – Icebox Watermelons". 喺2008-08-02搵到. ↑ "Watermelon Variety Descriptions". Washington State University. 喺2014-10-02搵到. ↑ "Watermelon growing contest". Georgia 4H. The University of Georgia College of Agricultural and Environmental Sciences. 2005. （原先內容喺2014-10-06歸檔）. 喺2014-10-05搵到. 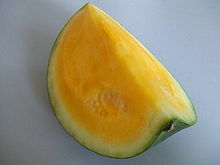 ↑ "Golden Midget Watermelon". 原先內容歸檔睇2007-10-11. 喺2014-10-05搵到. ↑ "Orangeglo Watermelon". 原先內容歸檔睇2007-09-27. 喺2007-04-23搵到. ↑ "Moon and Stars Watermelon Heirloom". rareseeds.com. 原先內容歸檔睇2007-12-17. 喺2008-07-15搵到. ↑ Evans, Lynette (2005-07-15). "Moon & Stars watermelon (Citrullus lanatus) — Seed-spittin' melons makin' a comeback". The San Francisco Chronicle. 原先內容歸檔睇2007-10-13. 喺2007-07-06搵到. ↑ "Moon and Stars Watermelon". （原先內容喺2007-06-02歸檔）. 喺2007-04-23搵到. ↑ "Watermelon, Cream Saskatchewan". seedsavers.org. 原先內容歸檔睇2009-02-21. 喺2015-03-11搵到. ↑ "Melitopolski Watermelon". 原先內容歸檔睇2007-09-27. 喺2007-04-23搵到. ↑ Hosaka, Tomoko A. (6 June 2008). 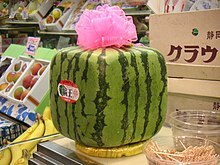 "Black Japanese watermelon sold at record price". The Associated Pres. （原先內容喺2008-06-09歸檔）. 喺2008-06-10搵到.